David-vs.-Goliath chart stories don’t come much more biblical than the one in the top two of the current Billboard Hot 100. In the penthouse: elite musical one-percenter Taylor Swift, with her hegemonic, already-on-top-the-instant-you-heard-it single “Look What You Made Me Do.” Buzzing the penthouse from one floor below: ex-stripper turned Instagram celeb turned reality-show luminary turned rapper Cardi B, with the rap banger of the summer, “Bodak Yellow.” As we head into the fall, Swift, a colossus of music who has spent the last decade carefully planning every move of her country-to-pop dominance, might be about to be upstaged by a woman who larkishly took up rap less than two years ago after a manager told her she might be good at it. We chart-watchers all have a rooting interest, and not just those who want to see Swift’s most chewed-over album-leading single taken down a peg. Frankly, the stakes for “Bodak Yellow” in the chart history books couldn’t be higher. If it reaches No. 1 on the Hot 100, it would be the first chart-topper by a female rapper in more than three years, since Iggy Azalea’s “Fancy” featuring Charli XCX in the summer of 2014. Limit the field to women of color, and Cardi — a black Latina, born Belcalis Almanzar to a Dominican father and a Trinidadian mother — would be the first to top the charts since Lil Kim was one-fourth of the 2001 remake of “Lady Marmalade.” Finally, among fully solo rappers, the field is truly limited: “Bodak Yellow” would be one of only two No. 1’s by an unaccompanied female rapper, since Lauryn Hill’s “Doo Wop (That Thing)” in 1998, nearly 19 years ago. It would also make Cardi B, nominally, the new Queen of Rap, a crown that has pretty much been owned by one woman for the entirety of the 2010s. That would be Nicki Minaj, who was self-declaring the honorific just six months ago in her rekindled beef with Remy Ma. Cardi already got mixed up in their war back in June, appearing onstage with Remy at New York’s Summer Jam concert during a Remy-curated all-star celebration of women in hip-hop (also featuring Queen Latifah, Lil Kim, MC Lyte, the Lady of Rage, Young M.A.) that pointedly excluded Minaj. But “Bodak Yellow” would short-circuit the entire debate by giving Cardi something factually undeniable that has eluded the reigning queen: a No. 1 pop single. Indeed, for all her multi-platinum success since her breakthrough a decade ago, Minaj has yet to score a Hot 100 chart-topper. She’s come awfully close several times. Minaj actually kicked off her major-label career back in 2009 with a prominent feature on a No. 2 hit, “Bed Rock,” a single credited to Young Money — the Lil Wayne–founded label group–slash–crew for which Minaj and Drake, among others, record. Among hits Minaj has led, 2011’s superlative “Super Bass” reached No. 3, as did her 2014 co-billed team-up with Jessie J and Ariana Grande, “Bang Bang”; and that same year, her Sir Mix-a-Lot–biting “Anaconda” made it all the way to No. 2. Ironically, Minaj was kept from the Hot 100’s top spot that week by “Shake It Off” — from the very same artist currently foiling Cardi B, Taylor Swift. So how likely is Cardi to surpass Taylor where Nicki fell short? (On Twitter, anti-Minajers and Nicki’s “Barb” army are already exchanging volleys over this possibility.) In early August, even before “Bodak” hit the top 10, the song was already the highest-charting hit by an unaccompanied female rapper since Minaj’s 2014 peak with “Anaconda.” Now, Cardi has actually matched Nicki’s No. 2 peak. What would it take for “Bodak” to go the last mile? Frankly, it will probably have less to do with Cardi soaring than Taylor waning — a rope-a-dope strategy where Swift’s front-loaded hit burns itself out. In terms of data trajectory, Taylor’s “Look What You Made Me Do” and Cardi’s “Bodak Yellow” are basically opposites. When the latter dropped in June, the former didn’t even exist yet. When Swift’s “Look” finally materialized, it entered the charts on a wave of hype, hitting No. 1 in two short weeks (Swift would have even done it in one, debuting on top, but “Look’s” first three days of airplay were large enough that it sneaked onto the Hot 100 one week early at No. 77). Whereas “Bodak Yellow’s” trajectory has been a rapid but steady rise over about a dozen weeks, powered by explosive week-to-week growth on streaming services as it came to dominate such blockbuster playlists as Spotify’s RapCaviar and Apple Music’s A-List Hip-Hop. The good news for Cardi on the Hot 100 is she now has the most-streamed song in America — and streaming is the single biggest factor on the chart. The bad news is her streaming numbers appeared to reach a ceiling last week, falling 12 percent, to 41 million U.S. streams; she only topped the streaming chart because Swift’s single fell more, down a whopping 35 percent in streams. (Like I said: Swift’s single is front-loaded.) The other two data factors keeping Swift on top, sales and airplay, are both slight handicaps for Cardi. “Bodak” has never been a big seller on buck-a-song sites like iTunes, routinely shifting less than 40,000 downloads a week, far less than the 150–200,000 a Hot 100 chart-topper typically rings up. 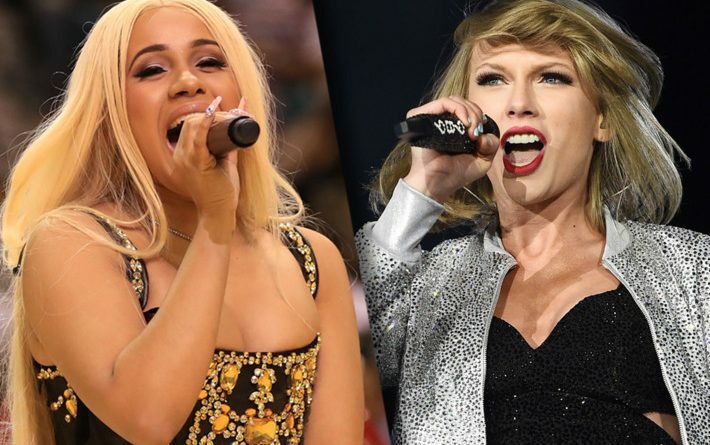 As for airplay, it’s Cardi’s growth story right now —“Bodak” now has the 16th-largest U.S. radio audience, up 2 percent in the last week — but Swift’s single ranks tenth. So Cardi’s team at Atlantic Records has its work cut out, and they are pulling out whatever stops they can to boost streams and sales. Early this week they dropped a remix of “Bodak Yellow” featuring Kodak Black — the rapper after whom the original single was named, and whose flow Cardi openly and lovingly imitates — and they have cut the iTunes price of both versions of the single to 69 cents. Labels have used such price-cutting tactics for decades, since the days of cassingles, to say nothing of hyped remixes designed to nudge songs to the top of the charts. But with so many rooting for Cardi to make history this week, there’s a sense of mission that makes these tactics seem less cynical than usual. Billboard will announce the next Hot 100 No. 1 on Monday, September 25.